The Scout Movement was founded by Robert Baden-Powell in August 1907 when he organised a camp for boys at Brownsea Island near Poole . 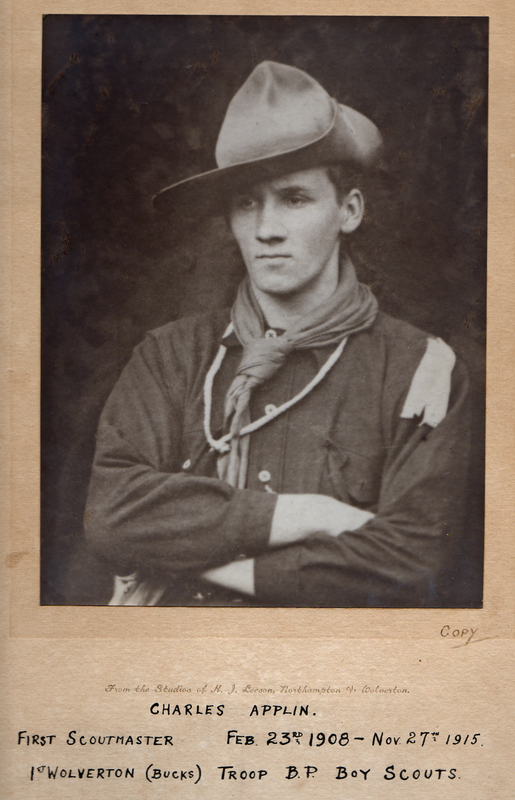 Just 6 months later the 1st Wolverton Scout Troop was founded – one of the earliest Scout troops in the country. The founder and first Scoutmaster was Charles Applin. He was born in 1889 and was just 19 years old when the original patrol of 8 young men got together. Charles was a member of the Bucks Yeomanry, a Territorial regiment, so he was called up when the First World War broke out. He died in Eqypt on November 27th 1915 and is buried there. As part of the Wolverton Scouts’ Centenary celebrations a Wolverton Scout Troop neckerchief was sent to the Foreign & Commonwealth Office and one of their Embassy staff in Eqypt took the neckerchief to Charles’ grave and photographed it there. 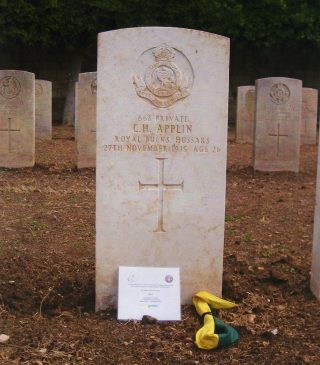 Charles Harry Applin was my Great Uncle. I have a photo of him in his uniform in the Bucks Hussars and a compiled history of his life. I also have his war medals, dog tag and his sword. I don’t have this photo of him or the photo of his grave. Very exciting to see these. If you can provide an email address I can forward this onto you. I currently live in Australia but on our next trip in December 2019 we hope to come to Wolverton.